Nearly 1.5 million Ohioans are expected to take a trip of more than 50 miles between Thursday and Sunday, according to AAA, helping to make this Memorial Day weekend the busiest since 2005.AAA predicts nearly 1.4 million of those travelers will drive this weekend, which would be a 2 percent increase from last year. Kimberly Schwind, a AAA Ohio Auto Club spokeswoman, said the expected uptick in travel this year is attributable to lower unemployment, rising incomes and lower gas prices. Gas prices in Ohio averaged $2.52 per gallon Wednesday, according to a AAA fuel report. Wednesday’s average is up 8 cents from yesterday and 22 cents from one week ago. However, compared to this time last year, a gallon of gas is 19 cents cheaper in Ohio. The average price per gallon nationally on Wednesday was $2.30. Last week, AAA attributed the rise in gas prices to increasing crude oil costs resulting from wildfires in Canada, as well as supply disruptions in other countries. Travelers should expect some major construction projects on some Ohio roads, according to the Ohio Department of Transportation. 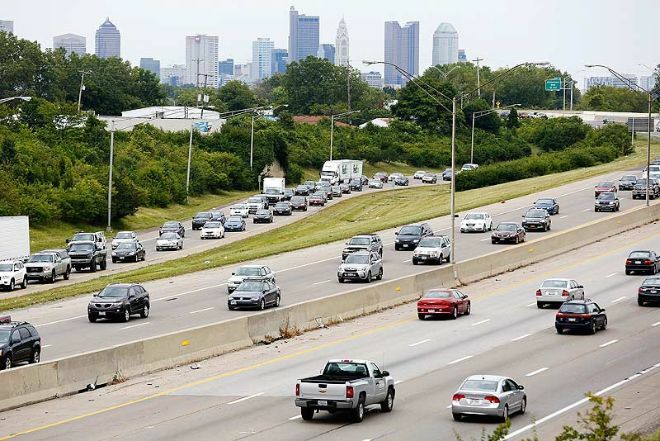 Ohio drivers should expect delays this weekend along I-75, particularly near construction projects in the Cincinnati, Toledo and Dayton areas, ODOT spokesman Matt Bruning said . Ohio State Highway Patrol Sgt. Vincent Shirey said troopers plan to increase patrols in expectation of the rise in traffic. Shirey also encouraged travelers on the road to remain focused on the road and avoid driving distracted. “We want to ensure that everyone gets to their destination safely and has an enjoyable holiday weekend,” he said. Memorial Day travels will coincide with the national Click it or Ticket campaign advocating seatbelt use. AAA also predicts a 1.5 percent increase in air travel in the state, with about 74,000 Ohioans flying to their destinations this weekend. Port Columbus spokeswomen Angie Tabor said she recommends travelers arrive at the airport about 90 minutes ahead of flight departure to allow time to get through checkpoints.